Suing a Car Dealership for Undisclosed Frame Damage | The Consumer Law Group, P.C. Many people choose to buy a used car instead of investing in a new car. For a significant savings over a brand new car, a savvy shopper can get a low-mileage, nice-looking car that will serve him well for years. However, some used car dealerships are out to cheat buyers and may purposely fail to disclose problems with the car in order to make more money on the sale. When a dealer fails to disclose known problems with a vehicle, he is committing fraud and you may be able to take legal action. One type of damage that a dealer may try to hide from buyers is frame damage. Frame damage occurs when a vehicle is involved in an accident and is hit at a crucial part of its structure, causing bending, shifting, or cracking of the frame. Structural damage such as this can put occupants at risk as the frame is what protects them from injury in a crash. A damaged frame can also lead to a weakening of other parts of the car which could mean more problems down the road. 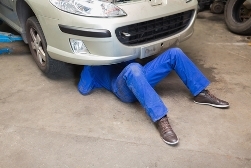 Your best bet is to have an independent mechanic inspect any used car you are considering buying before finalizing a purchase. It is not illegal for a dealer to sell cars that have previously been in an accident or have mechanical problems, but he is required to disclose any problems he knows about, if asked! There is no requirement to disclose accidents or problems he knows about unless asked about it by you. So always ask about any prior accidents or mechanical problems, and always have a witness with you. If you purchase a used car and later discover that it has frame damage that you were not told about, you may have a case against the dealer for fraud. Working with an auto fraud attorney will make the process of seeking compensation much easier. Call The Consumer Law Group for more information about pursuing an auto fraud case.